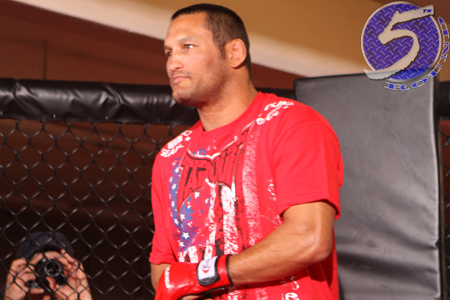 After 16 years, consisting of 40 professional bouts taking place on multiple continents, veteran Dan Henderson (pictured) was finally knocked out cold in a fight. Henderson’s first KO defeat came at the hands (or should I say, shin?) of Vitor Belfort Saturday at UFC Fight Night 32. Despite the fact that his body went limp and his eyes rolled to the back of his head as he hit the floor, Henderson claims he could have continued fighting. “I just got caught. I got caught with a nice little uppercut,” Henderson said during an interview on Fox Sports 2’s post-fight show. “I felt like I was still aware of what was going on. I know he threw a head kick and I was definitely dazed, for sure, but I would have liked to have, maybe, try to fight out of it a little bit. Thankfully, I’ve never been knocked out. I’ve been told I asked for another beer when I blacked out before, but I’m sure that’s like comparing apples to oranges. However, I would imagine it’s quite difficult to continue competing when you’re unconscious on the canvas. As mentioned in the opening sentence, this is Hendo’s first time getting KO’d so I’ll let him slide since he’s still probably trying to clear the cobwebs. In addition, even if Henderson wasn’t out, he was outstruck 13 to 1 according to FightMetric after blocking Belfort’s shin with his face. Furthermore, Belfort was standing over him waiting to unload more bombs if necessary. The defeat couldn’t have come at a worse time for Henderson, as his UFC contract expired the second after referee Dan Miragliotta stopped Belfort’s assault. UFC fighters typically get cut after losing three straight, so I don’t know what the market is for a 43-year-old free agent riding a three-fight skid. Henderson told UFC president Dana White he wants to come back. White said he’ll talk to Hendo in a couple of weeks.